“Ian’s book respects and reflects on Aboriginal Prophesies about the Eighth Fire and care of the Earth Mother. He investigates the spiritual lack in the modern world and proposes sound means to guide the course of humanity. For this he draws on the Wisdom of the Elders. This is a book for our times. It has his experience of Taming the Wild Mind, serving the Earth and the cause of Peace.” Grandfather William Commanda, Algonquin Elder, founder of the Circle of All Nations. Order of Canada. Joseph Campbell’s ground breaking work on mythology, The Hero With A Thousand Faces way back in 1949, contained a highly radical agenda, which was somewhat obscured in his later works. In the Epilogue of the 1968 edition he carefully mapped the reality of the Hero’s quest in modern times. With the insight of impermanence Campbell shows that times have clearly changed, that meaning no longer resides in the community or nature but in the individual. This makes the hero’s quest a radically different and more difficult venture as without the support of community, nature or religion the hero’s quest is to save the planet – not the bounded community or nation – and transform the entire social order of the world. Campbell is adamant that the great religions of the world cannot assist with this task, as they are complicit in the partisan fracturing of the world carried out by factions that curry favour with outmoded expressions of cultural nationalism. Their “monkey holiness” is not the stuff that can aid the hero (1968: 389), who now has a somewhat solitary task because the center of gravity of mythology has changed from nature and locality so that humanity itself is now the mystery to be unravelled. The modern hero…cannot, indeed must not, wait for his community to cast off its slough of pride, of fear, rationalized advise and sanctified misunderstanding… It is not society that is to guide and save the creative hero, but precisely the reverse. And so every one of us shares the supreme ordeal – carries the cross of the redeemer – not in the bright moments of his tribe’s great victories, but in the silences of his personal despair. 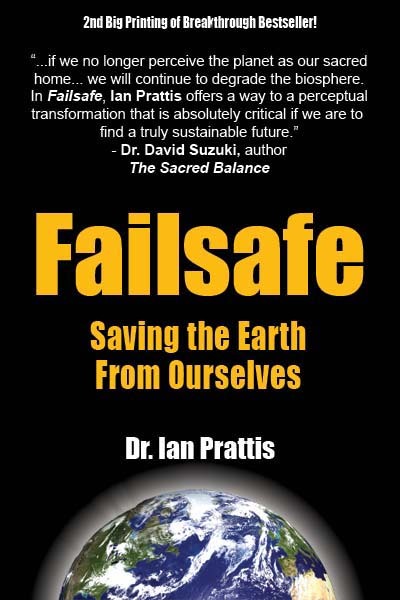 My book Failsafe strikes chords with Joseph Campbell’s insights from over a half century ago. Its genesis is in line with Campbell’s views, though I doubt if he anticipated the present global ecological emergency. This slim volume endeavours to provide understanding, issues a call for the adventure of transmuting the existing world social order by bringing the reader to a deep spiritual understanding of what needs to be done, and finally casts the hero’s mantle on all of us. Transforming the fabric of the entire social order asks citizens of the world to do the work of becoming spiritually responsible rather than remaining spiritual captives. This is so the revealed knowledge and wisdom gained from this adventure can be applied to society and the environment. I ask of everyone, including myself, to be a modern hero and heroine for our time. I loved the film ‘The Hero’s Journey’ based on Campbell’s realisations. It was very moving viewing and well done. This was the series with Bill Moyers – brilliant.